Sometime in the middle of a late night session in 2012 I was left staring at this computer screen running Cubase feeling absolutely nothing. There were more than 100 channels of audio and midi in front of me, all meticulously arranged, EQed and mixed over the last few months to work together. There was no clipping with enough mastering headroom and a kick and bass sitting under layers of sound but still sounding tight with enough body to make you move. It was usually the moment when I’d get off my chair and dance around the room celebrating the final mix but oddly it happened to be that moment where I’d slipped into a writer’s block that would last for about a year. You see a week later my studio hard-disk crashed and sent four years of work into oblivion. After getting over how stupid I was not to back things up, there was a moment of renewed hope in creating something fresh — starting with a clean slate to inspire a new sound. It was hopeless, however, since my approach was completely unfocused. It was trance one day, dubstep the next. From ambient, breaks, techno, dub — such an endless pile of projects lying unfinished that the fear of so much clutter threw me off the studio for weeks. I’d been contemplating buying a small analog mixer and a drum machine after geeking out over some videos online, so http://www.otcmedinfo.com/ with the depression from my studio disaster coupled with the brainwashing term ‘retail-therapy’ (from too many Indigo flights), I decided to treat myself to a 12 channel mixer and ordered the Korg Volca Beats drum machine. My list of gear already included a hand-built 303-clone, a reverb pedal, a Kaossilator Pro and a Shruthi1 synthesizer (a DIY kit from Mutable Instruments). Most of this stuff was used one at a time during studio recordings but once the mixer arrived it was a good opportunity to just plug everything in and let loose. It took a while to figure out how to sync everything. I didn’t have a MIDI splitter at the time so it was all done daisy-chaining the instruments. It was the moment when everything synced that something snapped. I knew this was a moment of transformation; a discovery of something that was always visible but not obvious till those sounds hit my ears. It was all quantized but just not in the same way; something just made it sound alive. The next few weeks felt phenomenal and sensing that I was getting better at this, I decided to record these sessions using my handheld recorder plugged into the tape out of the mixer. The realization that you can create a 7-minute track within 7 minutes is something that really changes you from a producer to a musician. It’s one of the most liberating feelings for someone who’s spent weeks and months struggling in the studio and it’s something that I’ve wanted to share with everyone possible since. I’m not going to talk about what happened next or make this into some kind of autobiography. What I’m going to go through next is the basic rig you need to perform electronic music live, so it’s all going to start looking like a to-do shopping list from here on but it is my sincere hope that it helps get you off that studio chair and dancing again! This is what’s going to get you away from the computer so definitely start with this. Mixers come in 2 forms – digital and analog. The analog mixers are cheaper and have a very classic workflow. The digital ones are expensive but they have great advantages like the ability to record your stems separately or add on-board effects. You could also find one that’s analog but has on-board digital effects. My suggestion is to go with basics and then upgrade later, so start with an analog mixer. Choose something with at least 12 channels if you’re looking to add more gear later on. If it doesn’t have on-board effects, find one that has send and return channels for off-board effects. Drum machines are an innovation that computers seemed to have replaced for many years but ask anyone who owns one and they’ll tell you there is no replacement. If you’re going analog check out the ones made by MFB (522, Tanzbar, Tanzbar Lite, Tanzmaus) or Vermona DRM1. 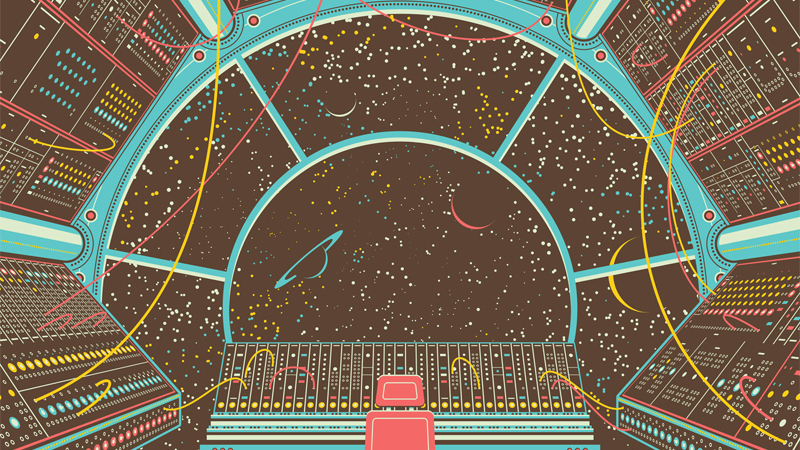 Like the mixer, the digital drum machine is much more versatile but lacks the simplicity of its analog parents. 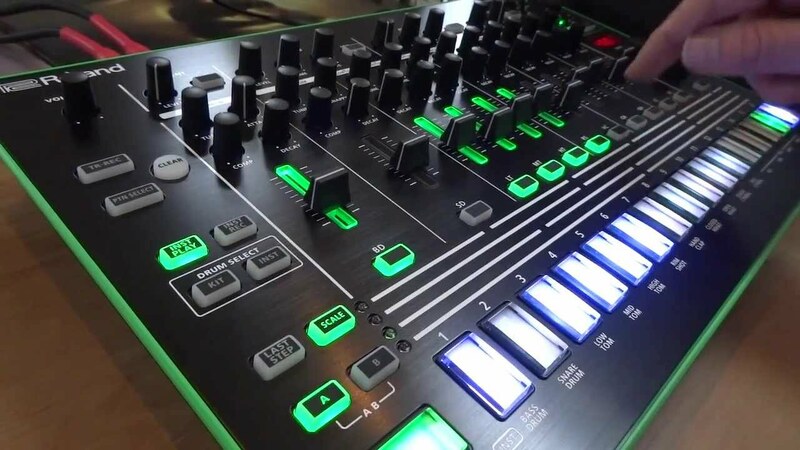 In the digital realm the Roland TR-8 rules the roost. There are plenty other digital drum machines but they all need a laptop to work, which is something I’m going to avoid. If you’re on a budget check out the Korg Volca Beats, it’s one of my most used machines even though it’s by far the cheapest. On the high end there are the Elektron drum machines and the Dave Smith Tempest. This is a tricky one because the bassline is something very personal. In general the bassline is a monophonic synthesizer with one oscillator and a low pass filter. Moog nailed this design with the Minitaur but there are dozens of mono-synths on the market with plenty of flavours. The Arturia Microbrute, Novation Bass Station, Doepfer Dark Energy, DSI Mopho & Dreadbox Erebus cover all this ground and much more. If you’re on a budget look at the Korg Volca Bass or the Meeblip Anode. They’re both small but extremely powerful machines that go well into the sub-bass realms. The keyboard is something I’d brought into my rig after playing around with a drum machine and bassline. Once you want to go beyond the stripped down techno sound it becomes essential. Your keys are usually attached to either a monophonic synthesizer (that which can only play 1 note at a time) or a polyphonic (more than 1 note or voice at a time). There are more precise terms like duophonic (2 voices) or paraphonic (multi voice with 1 filter) but that’s something to discover once you deep dive into researching synthesizers. The essential thing about picking the right keyboard is figuring out what kind of sounds you’re most attracted to. Always check out what the filters sound like when the resonance high, running the cutoff frequency along the whole range , the screech of the filter says a lot about the character of an instrument. Moog is famous for their smooth low-pass filter sound, while the Korg MS-20 is famous for its resonant dual filter architecture. The Korg Volca FM & Keys offer great starter option. If you can find any 1980s/1990s made Korg, Roland or Yamaha FM or Vector based keyboards buy them! The classic digital vintage sound is as amazing as the classic analog sound but not as sought after so you might find them at a bargain. The other option is to go for the new breed of digital synths put out by Yamaha (Reface Series) or Roland (Boutique Series) or the 4-voice Minilogue synthesizer by Korg. Don’t be scared for opting for something like a Casio too, there are no rules here. With the right effects and EQ a toy Casio piano can sound like whatever you want it to. There are some alternatives if you’re not really happy about playing keys. The Moog Theremini and the Korg Kaossilator are easy instruments to play and really efficient when you have other machines to control. The sequencer is the heart of your rig. When I first started I used to sequence each instrument individually, which is really the classic approach. In time it gets convenient to have control of everything from one space however this is also where the computer can sneak back into your life. Laptops definitely make fantastic sequencers, especially when running Ableton but there are plenty of other options. 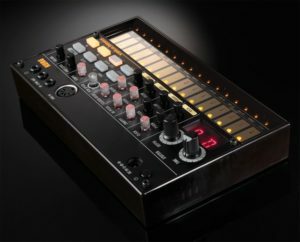 The Beatstep Pro is a new standalone device that can sequence 1 drum machine and 2 monophonic synths. An ipad or Android tablet makes for a powerful sequencer too with several developers writing software just for this purpose (Genome, Maschine, Arpeggionome, Modstep, Phaedra, StepPolyArp). Just remember that you’d need to buy a MIDI interface if you’re using a tablet. 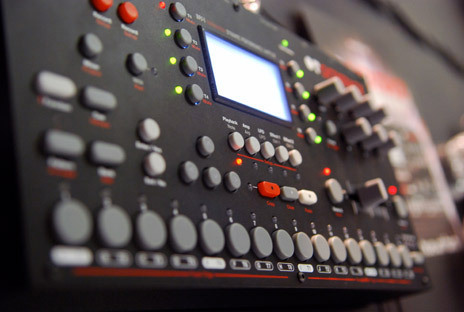 One of the most popular pro sequencers is the Elektron Octatrack, it’s built to be a sampler but functions just as well for sequencing hardware. If your mixer does not have on-board effects you’ll find your answer in the realm of guitar pedals. The guitarist space is much larger than the synth community with thousands of pedals to chose from so just try to cover your basics. Most mixers only allow 2 send-return channels so pick a good reverb and delay and you should be okay. Cheaper and smaller pedals like the Boss DD-3 and RV-6 sound great but don’t have MIDI which means you’re not going to be able to get a perfectly timed sync. There is a joy in the live feel of a tapped delay but if you want the option of both synced and un-synced effects, opt for something like the Boss DD-500 or the Eventide H9. Fair warning to those researching pedals: they can get very expensive, sometimes more than the synth itself. I think its still well worth it once you hear how much a good pedal can change a sound. The accessories are the splitters and cables, the plumbing of your rig. You’re usually looking at 2 things: the control signals (which in most cases is MIDI) and the audio signals. Sequencers send control signals out through one MIDI port so you’ll need a splitter to send it out to many devices. MIDI Solutions, Kenton, and Erica Synths all make MIDI Thru boxes which will turn 1 input into 4 or 5 outputs. Make sure you buy good quality MIDI and Audio cables. The quality is not really about sound as much as it is about durability. Doesn’t make sense having to buy a new cable every few months if you can get a good quality one that lasts longer. If you’re monitoring like an Audiophile or playing big PAs they sound better too. Concluding for the moment, these 6 sections cover the basics of what you would need to get started. I’ll be delving deeper into the process of routing and mixing the signals along with different ways of syncing to a clock in the next edition. Watch this space for the next installment in this series. 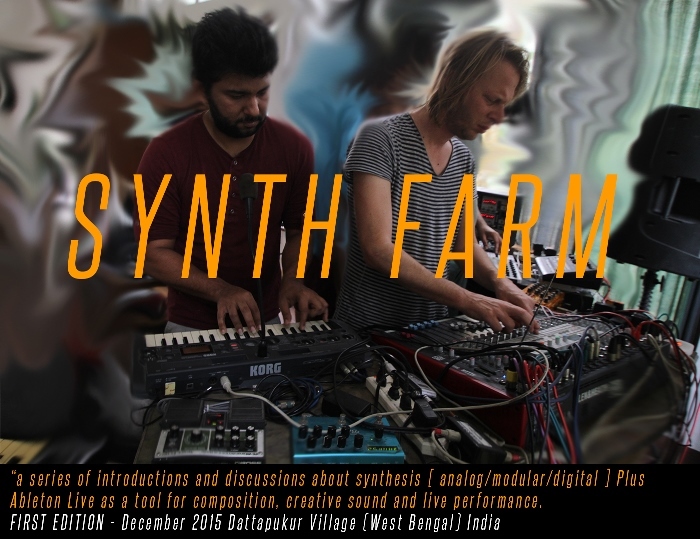 Littlei is organizing a 3-day retreat for musicians in Dattapukur village outside Kolkata called Synthfarm . The next edition of Synthfarm is from 30th September – 2nd October where up and coming producers can get hands on experience with modular synthesizers, live jamming rights and DAW production. Teachers for the upcoming edition are Lionel Dentan (Da Saz), Varun Desai (5volts) and Sumith Suresh (Braindrop / Synister). Discovering electronic music in the mid-90s in India, Varun Desai’s habit of compiling and manipulating sounds led to a DJ career under several aliases until he found the name Yidam, a word synonymous with a spiritual & meditative approach to music. Gigging extensively in the US, he formed the chillUmafia DJ collective with DJ Damon from Poland in 2005. Later years were spent managing a record label (DBR) and organising events around the country. After playing at Burning Man in 2008, Varun returned to his hometown, Kolkata. Since then his sets and tracks have been heard in Nepal, Germany, Poland, Switzerland & Portugal. A background in computer engineering matured into his Techno alias 5volts which involves the use of analog synthesizers, digital technology & interactive coding to create immersive audio-visual experiences.